Cleaning: many times, the facilities are used the next day. 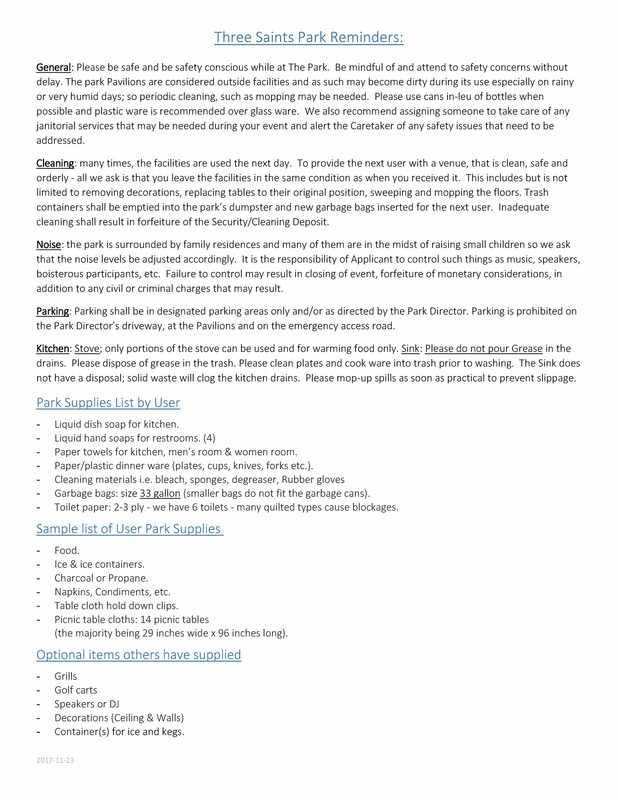 To provide the next user with a venue, that is clean, safe and orderly - all we ask is that you leave the facilities in the same condition as when you received it. This includes but is not limited to removing decorations, replacing tables to their original position, sweeping and mopping the floors. Trash containers shall be emptied into the park’s dumpster and new garbage bags inserted for the next user. Inadequate cleaning shall result in forfeiture of the Security/Cleaning Deposit. Noise: the park is surrounded by family residences and many of them are in the midst of raising small children so we ask that the noise levels be adjusted accordingly. It is the responsibility of Applicant to control such things as music, speakers, boisterous participants, etc. Failure to control may result in closing of event, forfeiture of monetary considerations, in addition to any civil or criminal charges that may result. - Ice & ice containers. - Table cloth hold down clips. - Liquid dish soap for kitchen. - Paper towels for kitchen, men’s room & women room. - Paper/plastic dinner ware (plates, cups, knives, forks etc.). - Garbage bags: size 33 gallon (smaller bags do not fit the garbage cans). - Toilet paper: 2-3 ply - we have 6 toilets - many quilted types cause blockages. - Container(s) for ice and kegs.